There are many ways parents and caregivers can help children thrive in their earliest years of life. 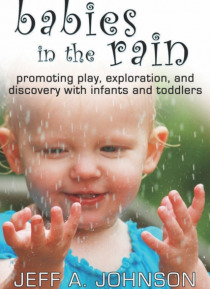 Babies in the Rain explains the theories behind the best practices for infant and toddler care as well as preferred methods for doing so. In a personable, humorous voice, Jeff A. Johnson shares his own stories about the amazing ways infants and toddlers learn. He offers valuable information on how … to spend quality time with young children by building strong emotional environments, nurturing meaningful relationships, and promoting child-centered, age-appropriate learning.